December 8, 2014 – After a voyage of nearly nine years and three billion miles —the farthest any space mission has ever traveled to reach its primary target – NASA’s New Horizons spacecraft came out of hibernation on December 6 for its long-awaited 2015 encounter with the Pluto system. Operators at the Johns Hopkins University Applied Physics Laboratory in Laurel, Maryland, confirmed at 9:53 p.m. (EST) on Saturday that New Horizons, operating on pre-programmed computer commands, had switched from hibernation to “active” mode. Moving at light speed, the radio signal from New Horizons – currently more than 2.9 billion miles from Earth, and just over 162 million miles from Pluto – needed four hours and 26 minutes to reach NASA’s Deep Space Network station in Canberra, Australia. “This is a watershed event that signals the end of New Horizons crossing of a vast ocean of space to the very frontier of our solar system, and the beginning of the mission’s primary objective: the exploration of Pluto and its many moons in 2015,” said Alan Stern, New Horizons principal investigator from Southwest Research Institute, Boulder, Colorado. Since launching on January 19, 2006, New Horizons has spent 1,873 days — about two-thirds of its flight time — in hibernation. Its 18 separate hibernation periods, from mid-2007 to late 2014, ranged from 36 days to 202 days in length. The team used hibernation to save wear and tear on spacecraft components and reduce the risk of system failures. The wake-up sequence had been programmed into New Horizons’ onboard computer in August, and started aboard the spacecraft at 3 p.m. EST on Dec. 6. About 90 minutes later, New Horizons began transmitting word to Earth on its condition, including the report that it is back in “active” mode. The New Horizons team will spend the next several weeks checking out the spacecraft, making sure its systems and science instruments are operating properly. They’ll also continue to build and test the computer-command sequences that will guide New Horizons through its flight to and reconnaissance of the Pluto system. With a seven-instrument science payload that includes advanced imaging infrared and ultraviolet spectrometers, a compact multicolor camera, a high-resolution telescopic camera, two powerful particle spectrometers and a space-dust detector, New Horizons will begin observing the Pluto system on January 15. New Horizons’ closest approach to Pluto will occur on July 14, but plenty of highlights are expected before then, including, by mid-May, views of the Pluto system better than what the mighty Hubble Space Telescope can provide of the dwarf planet and its moons. 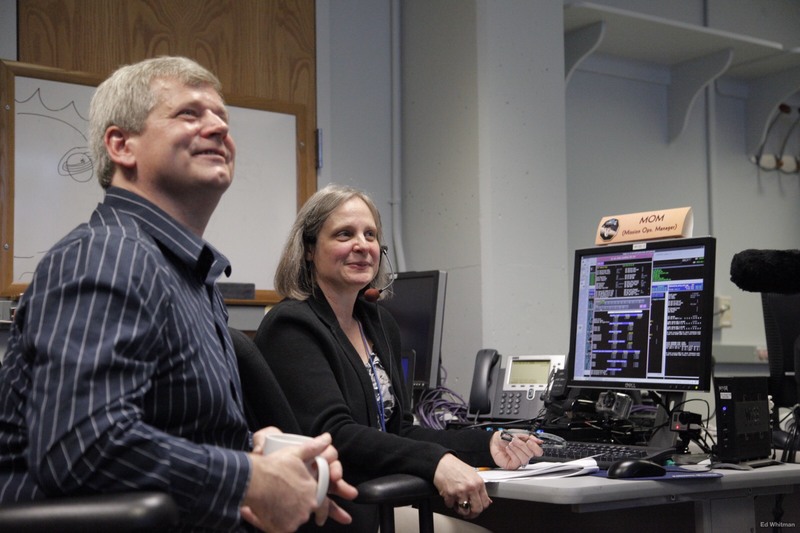 The Johns Hopkins Applied Physics Laboratory manages the New Horizons mission for NASA’s Science Mission Directorate. Alan Stern, of the Southwest Research Institute (SwRI) is the principal investigator and leads the mission; SwRI leads the science team, payload operations, and encounter science planning. New Horizons is part of the New Frontiers Program managed by NASA’s Marshall Space Flight Center in Huntsville, Alabama. APL designed, built and operates the New Horizons spacecraft. 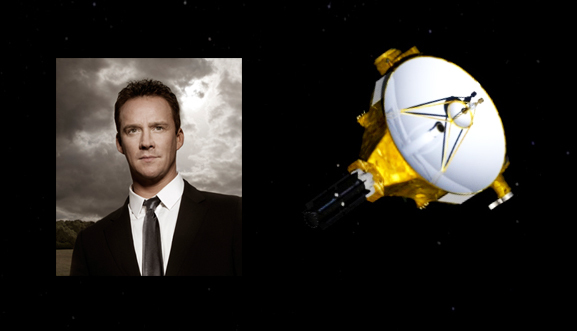 New Horizons joins the astronauts on four space shuttle missions who “woke up” to English tenor Russell Watson’s inspirational “Where My Heart Will Take Me” – in fact, Watson himself recorded a special greeting and version of the song to honor New Horizons! The song was played in New Horizons mission operations upon confirmation of the spacecraft’s wake-up on December 6. Listen to it here. 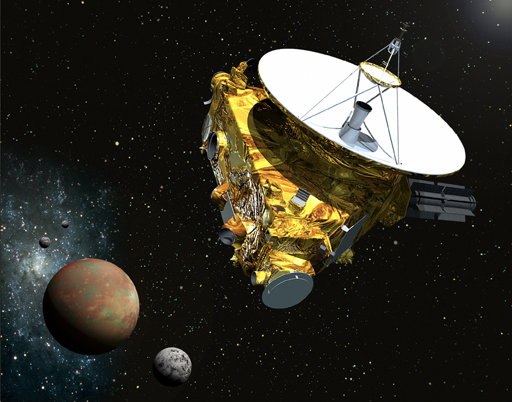 During hibernation mode, much of the New Horizons spacecraft was unpowered. The onboard flight computer monitored system health and broadcast a weekly beacon-status tone back to Earth. 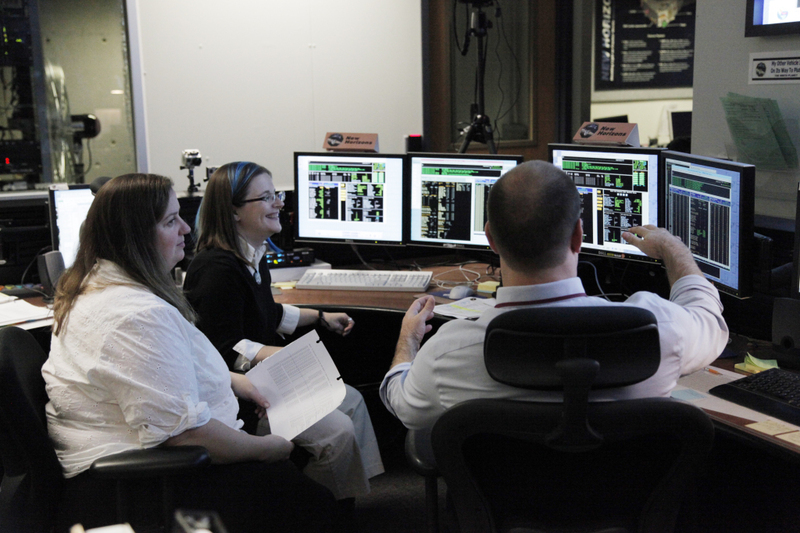 Onboard sequences sent in advance by mission controllers woke New Horizons two or three times each year to check out critical systems, calibrate instruments, gather some science data, rehearse Pluto-encounter activities, and perform course corrections.